GORE: Simulates two-way communication by having — having call-ins, but you’re quite right, that radio preceded television as the first broadcast medium. GORE: And the first concerns among defenders of democracy arose with radio, and that’s why the equal time provision and the Fairness Doctrine and the Public Interest Standard were put in place here. Those protections were almost completely removed during President Reagan’s term. RUSH: I’ve had this in the stack for a while here, and it’s time to get to this. Gore makes this false claim that, ‘radio is two-way now, simulates two-way communication by having call-ins, and but quite right, radio preceded television, and the first concerns among defenders of democracy arose with radio. That’s why the equal-time provisions and the Fairness Doctrine,’ and all that were put in. Robert Tracinski, Real Clear Politics, back on May 23rd had a piece called, ‘Al Gore’s Insolent Assault on Reason.’ It’s about his book, which, by the way, has been outsold the first week by Ronald Reagan’s diaries. Reagan’s diaries, the latest book scan, outsold Algore’s book by five copies, which means that the Algore people will no doubt be demanding a recount on this. ‘Early coverage of Al Gore’s new book, The Assault on Reason, has focused on the fact that the book is largely an assault on the Bush administration. But they have glossed over the most significant and alarming theme that Al Gore has taken up: his alleged defense of ‘reason’ includes a justification for government controls over political speech. Judging from the excerpts of Gore’s book published in TIME, his not-so-subtle theme is that reason is being ‘assaulted’ by a free and unfettered debate in the media–and particularly by the fact that Gore has to contend with opposition from the right-leaning media.’ Now, this piece goes on and on and on. I’ll tell you, it makes the point that I’ve tried to make over and over and over again about liberals. To them there is no debate; there is no alternative point of view. Anybody who expresses one is simply a gnat or a fly that has to be swatted away, not engaged. You don’t debate your opposition because there isn’t any. They are just a bunch of kooks. And they, the opposition, me, we are the ones getting in the way of reason. ‘Now here’s the really ominous part. This ‘manipulation’ is rendering our representative government ‘illegitimate’ because it only has the public’s ‘consent’ — he repeatedly puts ‘consent’ in scare quotes, just to emphasize the point that this consent is not, in Al Gore’s superior judgment, genuine or legitimate. As he puts it, ‘the ‘consent of the governed’ [has become] a commodity to be purchased by the highest bidder.” He simply doesn’t like the arena of ideas. He doesn’t like people in the arena of ideas competing and trying to win the day on ideas. His ideas are what should dominant and anything that threatens them must be swatted down with government control. That’s why he is for the Fairness Doctrine. So that’s the way to translate this sound bite from Algore. What’s really bugging him here is that there is an alternative point of view that’s gaining traction, and it’s persuading a lot of people that his global warming hoax, which is his latest religion, is having trouble getting traction with the majority of the American people. So his idea is not to go out there and continue to try to persuade people he’s right, his idea is to shut down the people who are standing in the way of reason. He, of course, is reason, nobody else is, and by the way, he’s not alone. This is pretty much the attitude of most liberal Democrats today, be they elected or not. This is Dave in Lynnwood — what is that, Michigan? Is that right? Welcome, Dave. Nice to have you on the EIB Network. CALLER: Rush, it’s an honor. CALLER: Hey, Rush, if Algore wants to cite Ronald Reagan to sell the case for the Fairness Doctrine, I think we ought to bring our former president on posthumously, and I think he could clean his clock. 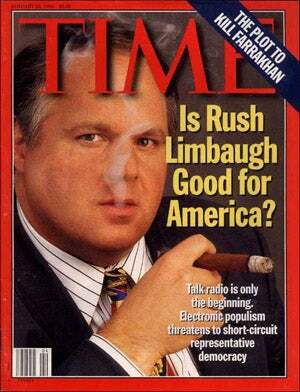 RUSH: Oh, there’s no question, if you ran Reagan as a corpse, you mean? RUSH: At first I was saying, what is this? We’re not going to run corpses here, but you have raised an interesting point. The point is, the antidote to all these Democrat candidates is Reaganism, which is conservatism. All these guys, Obama and Hillary and whoever else, are going to raise taxes, want to grow the government, not to mention what they’re trying to do with this immigration bill. They want to increase the redistribution of wealth. They want people to be poorer. They want to take wealth and opportunity for income away from people, and the antidote to this is exactly the kind of things Reagan said. It’s mystifying to me that so many Republicans today remain unwilling or maybe even embarrassed — well, it’s not totally mystifying, whether embarrassed to invoke Reaganism, it’s simply the Drive-By just kills them in Washington. In fact, we have some JFK quotes that precede Reagan. JFK I guess in ’62 made a speech in the fall of the Economic Club of New York making the case for his big tax cuts. I swear if you listen to these, you’re convinced you’re listening to Ronald Reagan. We’ve played those sound bites over the course of this program’s many, many stellar years of broadcast service to mankind, and when we do, liberal Democrats call here and are outraged, and they tell me that I don’t have the right to play JFK’s words. ‘Who are you? You’re a Republican. You can’t take his words and appropriate them for yourself.’ I’m an American, he was the president, and he was right. They just don’t want to hear Democrats talk that way. It’s funny. RUSH: Stockton, California, this is Robert. You’re next on the EIB Network. Hello. CALLER: You know, do you find it kind of interesting that Algore’s comments come, as well as the Fairness Doctrine, all this is coming just as Hugo Chavez is shutting down media in Venezuela? RUSH: Oh. Oh, let me tell you something about this. You will not be able to believe this story. The Drive-By Media is making excuses for what Chavez is doing because this TV station has ripped him and supported a coup against him. Here it is. It’s Bart Jones, who spent eight years in Venezuela, mainly as a foreign correspondent for the Associated Press. And he says this. ‘Would a network that aided and abetted a coup against the government be allowed to operate in the United States?’ Well, yes, it happens every day. What do you think the Drive-By Media has been trying to do for five years, if not sponsor some kind of a Democratic coup against George W. Bush? But this guy goes on to praise Hugo Chavez for standing up to this TV station because they tried to oust him, they tried to run a coup against him. Well, what do you expect? So he has a lot of support, and the Democrat Party in this country has a lot of support. Because he hates Bush. And they hate Bush. So any friend of theirs, anybody hates Bush, whether they’re an enemy of the country or not, is a friend of the Democrats and a friend of liberals. But you’re right. What Hugo Chavez is doing nationalizing TV stations and shutting them down is the Venezuelan version of Algore’s Fairness Doctrine.